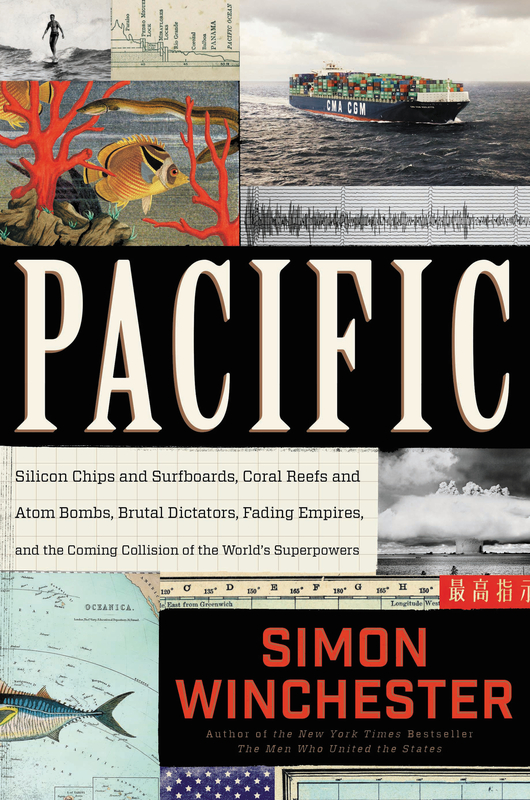 To tell you what Pacific is about would be to make a list, as the number of things discussed in this book seem to proliferate per page. Incidentally this makes it hard to write about in terms of what happens or what it contains because what is left by the end is a sense of having been taught something, but that whatever that is is mostly gut, that is, intuition. There is a feeling, and the reader is left to construct thoughts around that feeling. It is impossible not to discuss the contents in terms of theme as opposed to occurrence. The result, as both reader and thinker, is something of a mishmash. Pacific contains many interesting paradoxes. On the one hand, there is vastness – the ocean itself, 64,000,000 square miles. The subtitle, Silicon Chips and Surfboards, Coral Reefs and Atom Bombs, Brutal Dictators, Fading Empires, and the Coming Collision Between the World’s Superpowers, is a mouthful. The other hand holds concision – the ocean itself, ungraspable in its immensity, were you a sailor upon it; it must be viewed via globe or map and thus shrunk. The subtitle, lengthy, encapsulates every topic in the book (not bad as far as summaries go). And then there is time. Author Simon Winchester offers up myriad anecdotes from his impressive repertoire of adventures and experiences, sweeping at least a decade into the tidiness of a book, once more contrasting scope and scale. 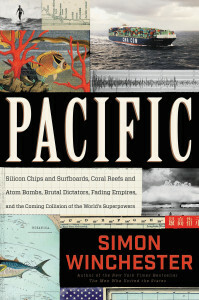 The most jarring element of Pacific is that it forces us to consider how closely the present butts up against history. That Hong Kong was a British colony until 1997 feels surreal. Much of Pacific induces a furrowing of the brow, an attempt to grasp just where we are in the scheme of history and the longevity of decisions made, what we can do about anything. Winchester shows himself as a master of balance. Pacific provokes reflection on what humans are doing now, specifically to the environment. Isn’t “now” just a preemptive history? Skillful placement of events effectively creates a feeling that there is no time, and that things which must be done cannot wait – waiting may result in our history being an impoverished one. All of this staging is set with politics and environment as the backdrop, suggesting the bizarre reality that weather patterns constitute politics, and that politics are as inevitable as nature itself. There is an undercurrent of invention, whether it be a literal invention or something more idiomatic as in to invent oneself. Amidst relating a great deal of horrors and events which, in typical media fashion, invoke dread and world-weariness, Winchester stands up and says “No” to being browbeaten by reality and advocates for change and progression, even something so brutally passe as hope. Never saying it directly and renouncing invectives altogether, he demands that humanity do better. Japan and Australia become the champions of this narrative, of both conflict and indominability. Winchester makes one significant risk in his ambitious undertaking. While ingesting vastly disparate material, we press on with the promise that he will give us a conclusion that ties everything together so that we’ll feel satisfied with the disparity of topics. The moment never comes. It is clearly possible to fashion one’s own reasonable justification for the amalgamation that is Pacific, but it is irritating that there is never a sense of Winchester’s purpose. Pacific ends with notes of the future, on what China has planned for the great ocean and what the U.S. plans on doing about it. Winchester implores us to forsake paranoia and to fully relinquish Empire, to be both open and aware, to participate in the making of whatever is next. Winchester at times comes across as a garrulous old relative, especially given the lack of closure, but the time spent listening, thinking and learning is far from wasted.